For youth who have the opportunity to participate in them, global education experiences have been directly linked to increased civic engagement levels, improved academic achievement, and future employment opportunities. However, there is a significant access gap in terms of who those youth are and where they come from. Youth with more access to resources and opportunities for global education not only become more globally connected, but they go on to be more professionally competitive as a result of these experiences. Global Switchboard Founding Anchor Member, Amizade, is trying to change that. As part of their Equity in Global Education project, Amizade works to close the gap by bringing access to global education and service opportunities to underserved youth who have historically been left out of of these experiences. Most recently, Amizade partnered with the Jeron X. Grayson Community Center also known as “the G,” in Pittsburgh’s Hill District and Youth Clubs in Northern Ireland to identify, fund, and facilitate an opportunity for 12 youth from the Hill District and 13 youth from Northern Ireland to partake in an international exchange experience. Together in Northern Ireland, the two groups participated in facilitated diversity sessions, group projects, and other activities, giving both groups the opportunity to get to know one another, and more importantly, discover similarities in their lived experiences. As the two groups came together in Northern Ireland, facilitated diversity sessions. group projects, and other activities allowed them to get to know one another, and more importantly, discover similarities in their lived experiences with discrimination. In the United States racial divides are geographic and affect access to services and opportunities. In Northern Ireland, the root cause of discrimination is religion; specifically, between Catholics and Protestants. The country’s “Peace Walls” divide the catholic and protestant communities and complement the segregation that has become a feature of normal life throughout the country. In this setting–from an American’s perspective–discrimination is less visible and more complex because it is not dependent on physical looks, but rather, private beliefs. 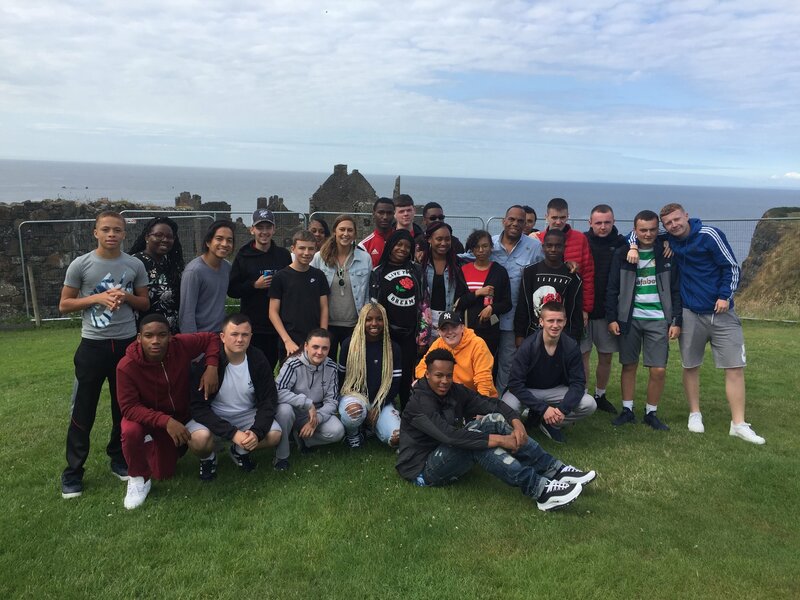 The trip to Northern Ireland was a phenomenal success that saw students from both groups drawing parallels in each other’s experiences from across the world. Amizade is now facilitating part II of this program, which hosts the 13 youth from Northern Ireland here in Pittsburgh! Amizade has now secured funding to continue this programming for a year. We look forward to seeing these journeys unfold. Look for these stories here!